Athletes work hard to develop incredible muscles. They use these muscles to make quick, powerful movements that lead to success in their individual competitions. As an entrepreneur, your essential “muscle” is your ability to make decisions. You either cultivate and strengthen this ability, or you let your decision muscles atrophy through procrastination and indecisiveness. If you find yourself constantly stressed and worried about decisions, the good news is that you can train this decision-making muscle. You can become a lean and fit entrepreneur who makes better decisions, and the 10 tips you will find in the rest of this article are a great place to start. I found these tips in a really good business book called Entreleadership by financial teacher Dave Ramsey. The book focuses on business, but the skills I will share can be applied just as easily to any area of your life. Just being alive is risky. Walking out your door, getting in a car, and driving across town statistically puts you in danger. Yet, you choose to make the decision to get out of bed, get in your car, and move on with your life every single day. Fear is really the main challenge to your ability to make better decisions. When you are paralyzed by fear, you freeze like a deer in headlights. Your instincts tell you not to move because something bad might happen. But in reality, inaction is usually even worse than deciding to take action. We call people who make no decisions and wait for their fate sitting ducks! In real estate investing, for example, my most profitable deals have come when I took bold, decisive action. If I had deliberated even minutes longer, I might have missed out on thousands of dollars in profit because a competitor would have made the decision instead. And in 2009 and 2010 when the economic world was in upheaval around us, my business partner and I made important strategic decisions so that we could survive and stay in business. Just sitting still and not making those decisions would have been financially fatal. So, fear is natural. But effectively responding to that fear with decisiveness is not natural. That’s what these 10 tips are designed to help you practice. In Entreleadership, Dave Ramsey says that he has a rule in his company not to make decisions out of fear or other powerful emotions. Dave recognizes that wise decisions are rarely made in fits of anger, fear, jealousy, greed, or extreme excitement. A great example in real estate investing is an auction. Sellers at auctions depend on upon buyers being driven by fear and other emotions so that they’ll pay the highest price. Buyers become afraid of losing a deal because they see others bidding against them. They also get competitive and even greedy as the bidding heats up. As a result, buyers often make irrational decisions. All experienced auction buyers know that the decision on price MUST be made firmly before the bidding starts. I have personally made a bad decision at an auction because I did not decide beforehand. I learned my lesson, and now I always write my highest bid down and never go above it. But most real-life situations aren’t like an auction where you can decide your price ahead of time. Instead, you’ll often find yourself facing decisions while in states of heightened emotions. One of the best things you can do is decide not to decide. Like the decision to punt in football, you’re deciding to cut your losses and wait until a better moment to move forward. Once you calm down, you can then think clearly and use the rest of the tools listed below to make a better decision. Some decisions come with built-in deadlines. If you borrow money and the loan principal must be paid off in one lump sum by a certain date (i.e. a balloon note), the decision deadline is set for you. You must decide to refinance, sell, or save enough cash in order to avoid negative consequences with your lender. But many other decisions have no real deadline, and as a result, they get delayed and delayed. In these procrastination situations, create your own deadline. As I explained in Anti-Time Management – Parkinson’s Law, self-imposed deadlines force you to make a decision. You may find, as I have, that you make a better decision giving yourself one hour instead of one week. The size of the task or the decision tends to swell with the more time you give it. Deciding what to order for lunch will not change your life. So, just make the decision and keep the line moving! But purchasing your first investment property has larger risks than a turkey sandwich. So, it’s reasonable to allocate more time for preparation, research, and deliberation. Of course, the time required even for important investment decisions changes as you become more experienced. When I first started, I had sweaty palms for days deciding what to offer on an investment house. But after 13 years of experience and hundreds of transactions, I can now decide an offer in minutes. Your emotions are actually helpful as messengers in these situations. If you are about to pass out with fear about a decision, take some more time. Get some help. Use some of the tips in this article. But if you are confident and the potential negative consequences are minimal, decide quickly and move on. I learned when I was a kid not to corner an animal. One night we came home to find an opossum hiding in the corner of our garage. We got out of the car and stood between it and the doorway for escape. In desperation, the animal began to hiss and show its sharp little teeth! It looked like this! 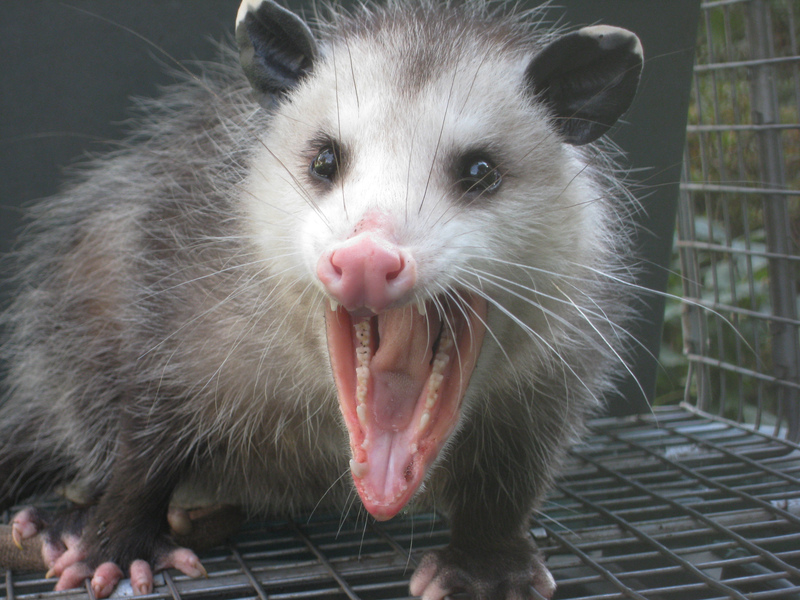 The opossum had run out of options. It judged that its only decision was to fight or die. You and I also make desperate decisions when we run out of options. The trick is not to get cornered. And you get out of corners by gathering more options. For example, you know the difference in a negotiation between having one option and many options. The person who can walk away because she has multiple options will always make the best deal. The person with only one option can only take what she can get, which is often a bad deal. The same is true with other business decisions. I regularly make decisions about mini-crises related to tenant payment problems or house maintenance issues. When I talk to my team members or repair contractor about the situation, they often try to corner me with my decision. They give me choices A and B, both of which I don’t like. My typical response is to say, “What would need to happen to give me options C and D?” I usually get some objections or reasons why not, but as we explore those possibilities we often come up with more, better options. When you push through the initial paralysis of feeling cornered by a decision, you’ll often find that your creativity goes into overdrive to bring about new and innovate ways to handle a problem. More options lead to better decisions. Information is power. Ignorance is not. When I first began real estate investing, I was ignorant about remodeling houses. After all, I studied Biology and German in school, and I played football. Not very helpful skill sets for repairing real estate, it turns out! My business partner and I would hire contractors to repair a problem in a house. But we were too dependent upon their expertise, and we had to trust that they would always make the right decision for us. That did not always go well. Today information is at all of our fingertips. A quick search on Google or YouTube will produce answers to almost any question or challenge you face. Need to change out a washer in a faucet, watch a 2 minute tutorial on YouTube. Need to make sure your tile installer is prepping the floor correctly, quickly read a checklist for tile installation as a refresher. Gathering information when I am ignorant of something has almost become a game for me. If I find myself stumped by a problem, I go research. It’s fun, and it helps me make better decisions. Of course, this does not replace real expertise born by experience. You won’t be able to install that tile floor immediately just because you read a checklist. But more information does allow you to ask better questions. More information makes the right and wrong decisions become more obvious. And more information removes some of the natural fear that comes from ignorance of any topic. I have a rule in my real estate business never to make a large acquisition without at least letting 2-3 people I trust evaluate it with me. No matter how much I know, I am sure to have blind spots. Wise counsel from others gives me confidence and avoids large problems. You may have different people on your list depending upon your business or situation. But the important thing is to actually have the list, and then call upon them when you’re facing an important decision. Almost every experienced investor or entrepreneur I have spoken with uses some form of this question to make decisions. It creates a line in the sand which allows you to see the consequences of a decision clearly. This is also called defining the nightmare, and it can be very liberating. While it might seem pessimistic, it actually frees you up to make more optimistic, forward-thinking decisions. In business, the worst case often involves losing money. But other worst cases could include potential lawsuits, public embarrassment, wasted time, enormous hassles, and even jail time! Asking this question and exploring the answers is really an emotional exercise. You are testing out how it would feel if the worst case actually happened. If you can live with a worst case scenario, then move forward. If you can’t, then don’t make that decision. It’s as simple as that. In the best versions of ourselves, values always guide our decisions. But it’s easy to get busy, rushed, stressed, or confused by decisions so that we lose sight of what’s most important. So, it makes a lot of sense before any decision to slowly and carefully judge the consequences using your own personal values. We must continue to measure every act against not only what is legal but also what we would be happy to have written about on the front page of a national newspaper in an article written by an unfriendly but intelligent reporter. The main point is to incorporate your own guiding principles into the everyday decisions you make. Write down your values. Explain to yourself what they mean. And practice using them on a daily basis with your decisions. I think you’ll find decisions become much clearer and easy to make as a result. Overwhelm is a form of fear that paralyzes your decisions. When you have too much on your mind, it becomes difficult to think clearly or to make good decisions. My friend and fellow blogger named Chris tackles large financial decisions by “eating the elephant one bite at a time.” In fact, that’s the name of his really good blog. Taking small bites is a good strategy for any decision that seems to overwhelm you. If you are faced with 12 choices, narrow it down to 3. If you want to buy 10 investment properties, decide to buy your first one. If you want to save $100,000, decide to save $10,000. Chunking decisions into smaller, bite-sized pieces allows you to process them and move forward. Decisions are not easily made inside your head. If you’re stuck on a decision, try talking about it or writing it out. My wife is a great listener. I often unpack problems or decisions to her, and by the time I’m done, I’ve figured it out! Has that ever happened to you? It’s one of the many benefits of communicating about your business with close friends and family. The same thing can happen if you write out your thoughts. I was recently deliberating about a property we wanted to purchase. The analysis was a little more complex and multi-faceted than I was used to. So, I wrote myself a report. I explained the good and the bad of this decision. I explained the facts that I knew. And after reading my own report and discussing it with my wise counsel (see #6), I decided to move forward on the deal. Better decisions are not the same as perfect decisions. Even with these 10 tips, you and I are bound to make bone-headed decisions. We’re bound to miscalculate, mess up, and cause problems. But the more we practice, the better and more confident we’ll become. For every bad decision we make, we’ll learn to make two more good ones. And like a baseball player who makes the All-Star team with a success average (batting average) of only .333, we entrepreneurs can also win while being less than perfect. Which of the 10 tips did you like? Do you have any other tips that you use to make better decisions? Do you have any examples of decisions you’ve made that were better than analysis-paralysis? I’d love to hear from you in the comments section below.